About: Gallery Cafe serves all day breakfasts, rolls, sandwiches, ciabattas, pizza and pasta. They also serve hot and cold drinks. Outdoor seating is also provided. 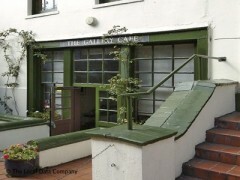 The Gallery Cafe is a little vegetarian cafe connected to the Buddhist Centre. It has a light and airy interior with outdoor seating in a front courtyard. nice porridge with apple and bananas. nice coffees. seats outside catch the sun. stir it more and fry it more . The Gallery Cafe is a charity run cafe that serves up incredibly tasty and mighty portions of vegetarian and vegan food. It is fast becoming a popular music venue and runs some very interesting groups and clubs for the local community. There have been some incredibly talented musicians play with FREE Live music happening every Wednesday and Friday. There are various other things happening at the cafe like a knitting club where you can learn to knit or teach others what you know and the poets corner with recitals of rehearsed or original poems. The cafe is an excellent place to go to during the day if you want somewhere quiet to do some work with free WIFI and the selection of teas, coffees and fruit juices is not to be sniffed at. The staff are warm and friendly and the price of the food and drink is very reasonable and being a charity run cafe you know that your contributing to the 30 or so charities that are housed within St. Margaret's settlement. If your ever stuck for what to do on a Friday night, I Highly recommend that you check out the Free Fridays at the cafe where you can see some of the finest talent on London's Acoustic and electronic music scene. There is a nice selection of bottled beers and ales, and wines and if you like you can also have a game of scrabble or dominoes. There is so much going on at this humble cafe that I fear I could ramble on for some time. The Gallery cafe also takes part in Time Out's First Thursdays, when it opens its doors late for a chance to see amazing art, culture and events after hours. Every month you can see a new art installation from local artists. They are very on the ball with the promotion of the events that take place within the settlement and you can find literature in the cafe on everything that is happening there! This is a great little Cafe with a huge community vibe and a hub that I am proud to be a part of.